In this article we will look at the best filters for goldfish. Filtration is an important aspect of maintaining any aquarium’s health and appearance. A single goldfish needs an aquarium of at least 30 gallons and a pair should have at least a 50 gallon tank to thrive in adulthood. For that reason, all of these filters will be suitable for medium to large tanks using 50 gallons as a minimum filtration capacity. Why Use Filtration For Goldfish? The very popular goldfish comes in many beautiful varieties and colors. They are often sold as small juveniles but can grow to be upwards of 12 inches in length given the proper amount of space. Their size requires them to be kept in a medium to large aquarium. Small goldfish bowls requiring daily water changes will only work well while the fish are very small. They will not thrive in these conditions as they try to grow. Keeping goldfish in small bowls or tanks is a sure recipe for disaster and your fish will probably not survive for long. If you plan on keeping multiple goldfish you should be prepared to use an aquarium of at least 50 gallons. A tank this size needs a substantial filter system to maintain water quality. The best systems will provide mechanical and biological filtration as well as performing the function of adjusting the tank’s chemistry to provide the healthiest environment possible for your goldfish. Filtration is one of the key ingredients in maintaining a healthy aquatic environment. There are many types of aquarium filters on the market. All require some kind of maintenance to keep them in proper running condition. Some have reusable sponges and cartridges that can need periodic cleaning while other systems have disposable filter cartridges that simply need to be replaced as their performance degrades. Aquarium filters usually come rated for a specific tank size. Since goldfish do produce a large amount of waste material you should consider purchasing a filter designed for an aquarium that is larger than the one where it will actually be used. 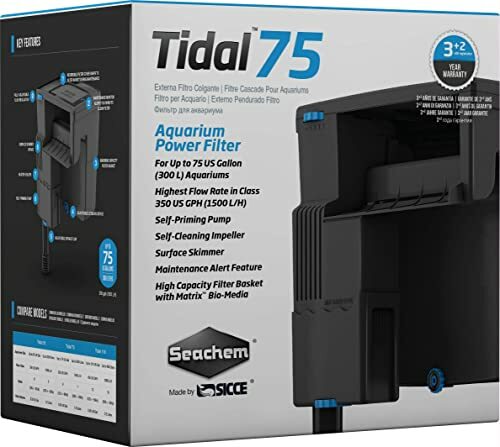 I would suggest that a filter designed for a 75 to 100 gallon tank would work very well for a 50 or 55 gallon goldfish tank. If you are planning on keeping fancy goldfish you also want a filter that allows control of the return water flow. These fish do better with a gentle water flow so make sure the filter you choose has that option. Many canister filters have a spray bar option that will diffuse the return flow and create a perfect environment for your goldfish. The previously mention canister filters are one of the best choices for a goldfish tank. The other good option is a hang on the back (HOB) type filter. Both have some general pros and cons. Canister filters require maintenance less often and their filter media is usually reusable. They require less space behind your tank as the canister is housed below and only tubes need to get behind the tank. 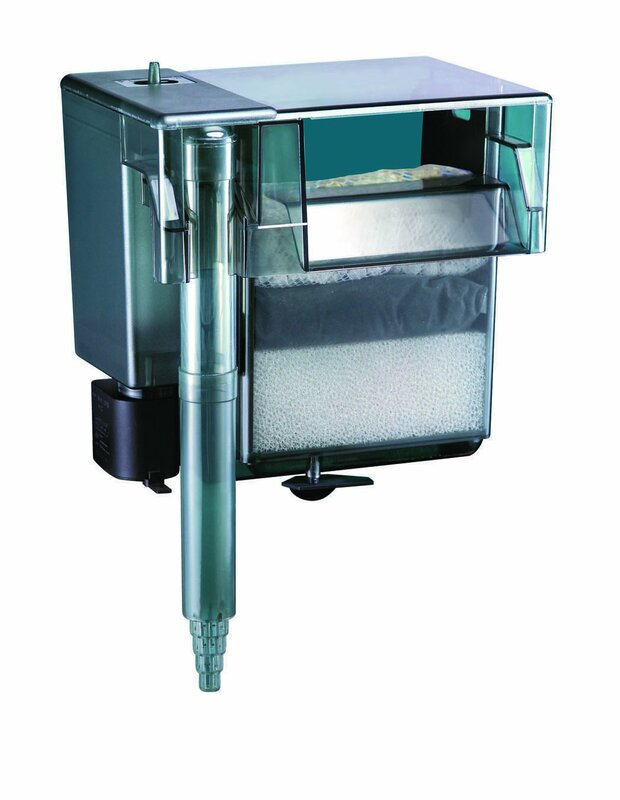 Canister filters offer high filtration capacity and a single unit can handle a large aquarium. Return water flow can be controlled to achieve different flow patterns in your tank. These benefits are somewhat offset by the fact that canister filters are more complicated to clean when needed. The HOB filters offer easier maintenance at a price. They are easy to set up as long as you have enough room behind your tank. They are initially less expensive than a canister filter but a monetary consideration is that the filter media is in many cases disposable and is an on-going expense. An HOB system uses a waterfall type water return system that cannot be modified as nicely as that of a canister filter. These filters are usually not enough to take care of large tanks when used singly, but I have successfully used two at a time on my larger aquariums. Here are some of the best filters you can purchase for your goldfish tank. 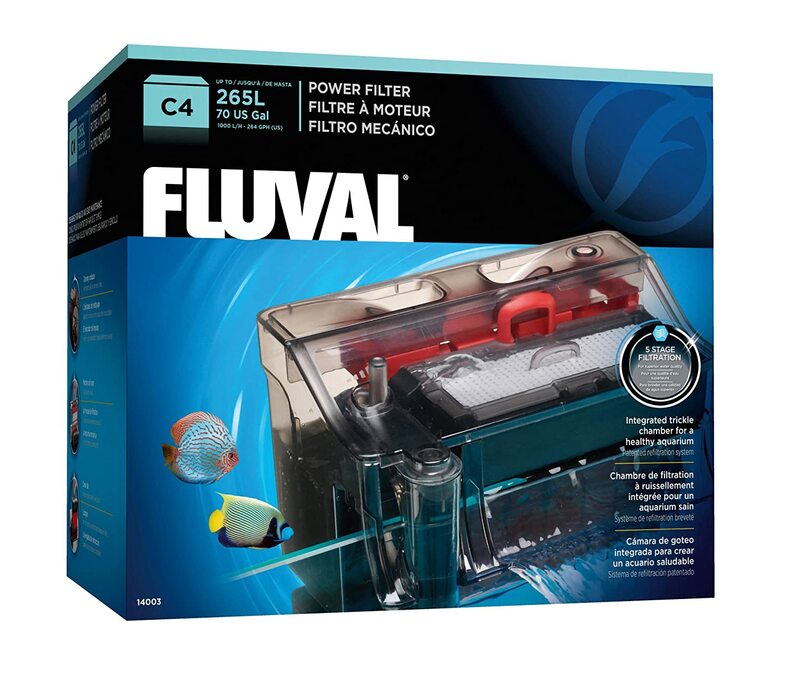 The Fluval C4 Power Filter is an HOB type filter that would work well on goldfish tanks up to 50 gallons. It provides extensive mechanical, biological and chemical filtration through a 5 step process that leads to clear and healthy aquarium water. 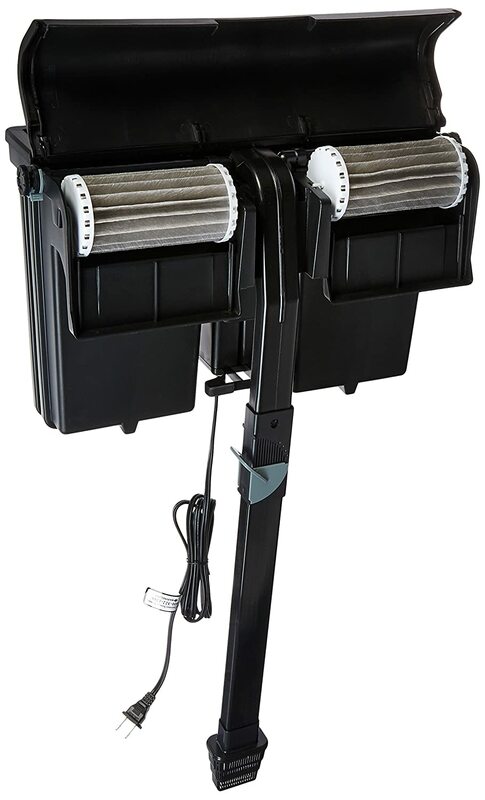 A nice feature of this filter is that it uses a patented refiltration system that allows you to slow down the water output to protect delicate plants and fish. Its modular design allows you to perform maintenance in stages, replacing or cleaning only one type of media at a time. This filter combines some of the best features of a canister filter with the ease of use of an HOB. It is designed to allow customization of the filter media if so desired, to say replace carbon with another biological filtration pad. The filter also has a telescoping intake tube to allow water to be drawn from different depths of your tank. A nice choice in an HOB filter. 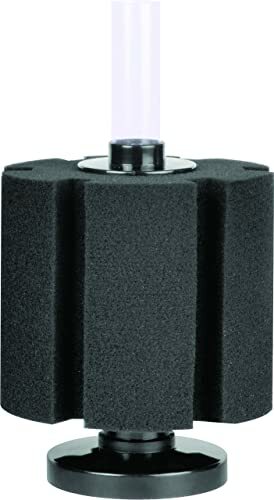 This is another excellent HOB power filter that will do well in a 50 to 55 gallon goldfish tank. Its design gives the filter up to twice the mechanical filtration capacity of other HOB filters or the addition of additional chemical filtration cartridges. Biological filtration is handled by its patented Bio-Wheel technology. Spray bars are used to drive the water into the top of the bio-wheel getting maximum aeration along with the biological filtration. It is easy to clean and install as seen in these videos found at the Mainland website. AquaClear manufactures these power filters in varying sizes with the 110 V model a prefect match for a 50 to 55 gallon goldfish tank. This filter provides complete mechanical, biological and chemical filtration through a multi stage filtration system. It is quiet and has a large filtration volume that allows for superior contact time with the filter media. A unique waterfall system gently and silently returns the filtered water to your aquarium. It also has a flow control feature that enables you to change the water flow rate to suit your needs. As with most HOB filters it is easy to set up and its media baskets make for painless maintenance. Additional media to perform custom chemical filtration can be added to the media baskets, and you can use your own bulk materials in nylon bags instead of being tied to a manufacturer’s replacements. Those aquarists wanting to go with a canister filter won’t go wrong with this filter. As with all canister filters it does great job of mechanical, biological and chemical filtration. It accomplishes this by using stacked filter trays that force the water to go through instead of around the layers of filter media. It comes with a quick prime button to assist with restarts and promises quick spill-free maintenance. The top of the unit is easy to remove for access to the media baskets.It is easy to set up though care must be taken to follow the instruction in regard to the O-rings to avoid leakage. This is a quiet filter that will do well for a 55 gallon goldfish tank. Fluval makes a great canister filter in addition to the HOB filter reviewed above. It performs complete 3 stage filtration through the use of layers of various filter media that can be customized for your tank’s requirements. Employing a sound dampening impeller design leads to quiet operation. Its square design allows for more water to be exposed to the filtration elements than other manufacturers round design. 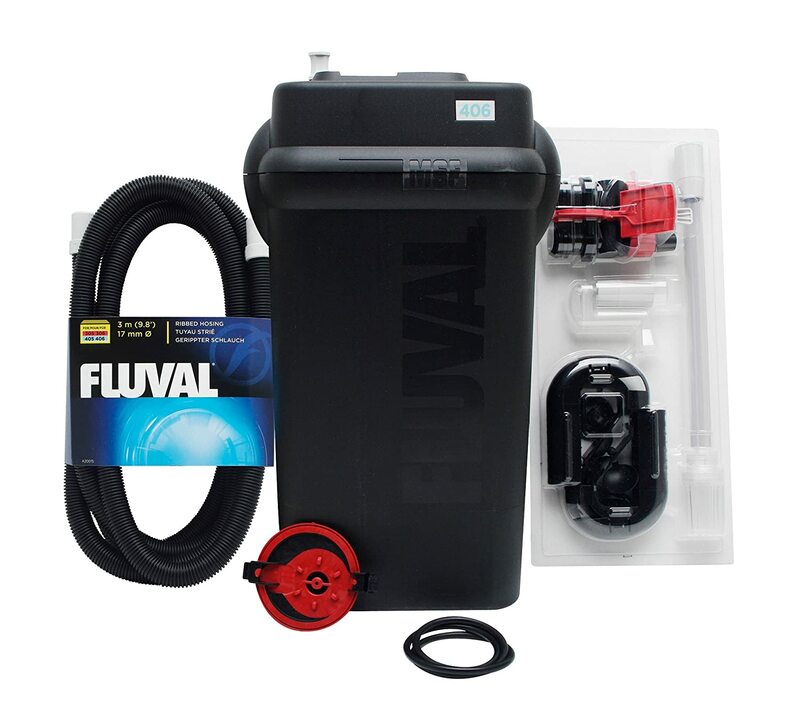 Fluval has re-engineered their priming system which makes the filter easy to start. Its aqua stop valve assembly makes it easy to remove hoses for simple and drip free maintenance. The 406 is the right size filter for a 50-55 gallon goldfish tank and you will be pleased with the results. If you have fish that lives comfortably in low flow water or tiny ones that might get sucked into regular filters, then this is what you should get. Unlike other cleaners, it is not as expensive so for those with a tight budget. This product would not hurt your wallet as much; and as a bonus, it provides no noise. If you are worried about going through the trouble of cleaning, it is surprising to know that it is actually easy to clean due to its soft sponge material. What I really like about this filter is that despite its size, it’s still able to look excellent inside of smaller aquariums. Goldfish filter set up is not even an issue because it is quick and simple. You do not need to go through complicated processes. With its low flow, it is the best filter, especially for 10 to 20-gallon goldfish tanks. The base is weighted, but it wasn't enough to keep it from floating up. 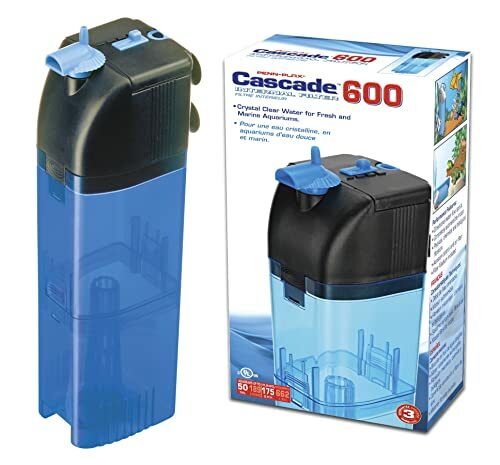 For those people who have tanks that are above 50 gallons, this filter is the best canister filter for goldfish tank and would be the right choice. After all, with how it’s able to take in 175 gallons of water per hour, the state of cleanliness within your tank will remain for weeks and even months. With that amount of water filtered in just one hour, it is indeed a powerful filter. However, no need to worry about the goldfish filter being too strong or the distribution of water since it has a spray bar option that will aerate your tank no problem. If you have a lot of goldfish that is bound to get your tank dirty very fast or turtles, then this filter will be able to handle the strain of the entire gunk. It’s quick, it’s strong, and it’s easy. It is a very powerful filter so it wouldn’t be recommended for smaller tanks with even smaller fishes. This filter has many different options that you can use to adjust according to the type of tank that you have, and it even has an automatic maintenance alert mechanism for when you need to clean the filter. With that, you would not have to keep checking at different time intervals just to see if it is already due. 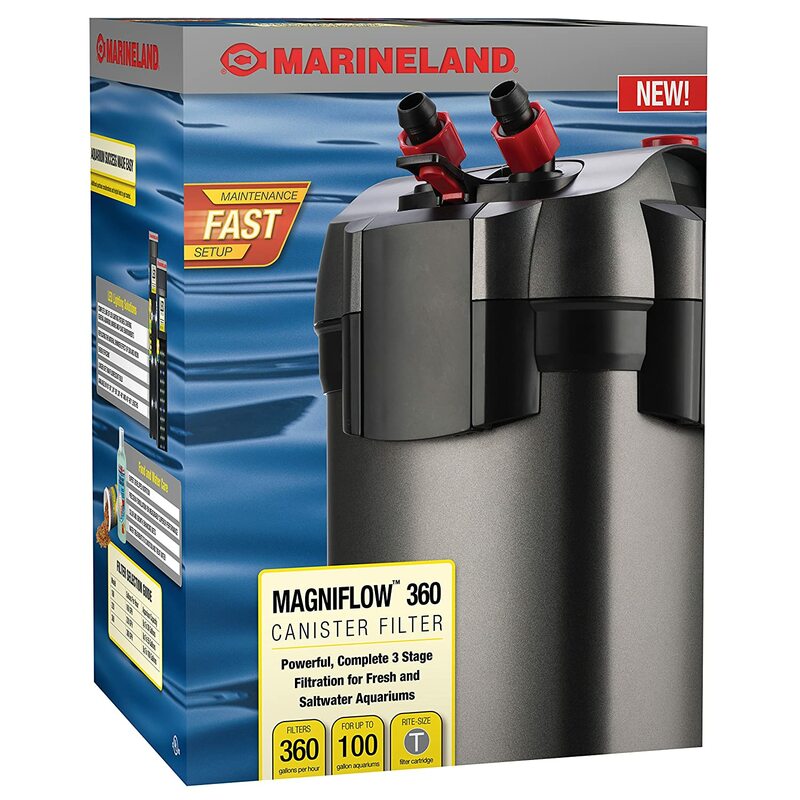 It’s the kind of filter that can allow you to control the intake with three points, where you can also turn it completely off so you can use it in shallow tanks without any worries. With the 3 point option for the intake, you can have better circulation for your goldfishes within the tank, and that's really something your fishes will enjoy. Also, it even leaves a significant amount of space. So much that it enables you to put in other filtrations. All of the filters reviewed above are excellent and will do a fine job of maintaining your goldfish aquarium as long as you properly size them. As stated earlier, for large tanks you may want to use multiple versions of the same filter to achieve the best results. You can choose to go with an HOB or canister filter to suit your preference. With that said I would recommend the Fluval C4 Power Filter if I were looking for a filter for my goldfish. The excellent 3 stage filtration combined with the ease of use and maintenance makes this a winner for me. The fact that this filter lets you control the water flow to protect delicate fancy goldfish make this a great choice for any aquarist who keeps goldfish. My goldfish have a 40g Whisper HOB filter, and it was great for a while, but I had to rig up some of the tubes when one broke, and now, in my new house, it’s right next to us on the couch and it’s loud. I can’t seem to find anything on decibel ratings for any filters, and the only advice I see is to use a canister one. My HUGE fear is that if the power goes out, I’m afraid having the canister below the water levels in the tank could lead to the water pouring down the hoses and all over my house. Could this happen? And, do you know anywhere I could look for decibel ratings? Right now my tank is running around 60-70 decibels, and that’s just too loud to watch tv next to. This is the great article. Thanks for sharing this.